A great release, thoughtfully edited and put together and a must have for fans of Hevy Devy. 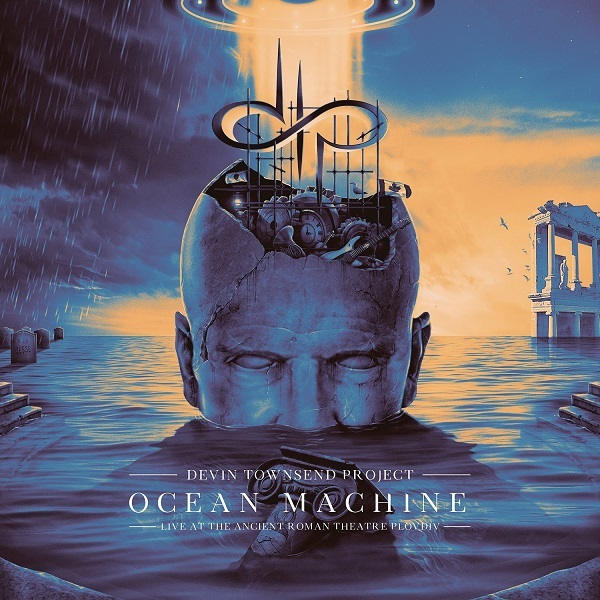 Ocean Machine: Live at the Ancient Roman Theatre is the Devin Townsend Project’s upcoming release; I was treated to an early copy of the DVD for review. With a just short of 3 hour live show filmed September 22nd 2017 and addition behind the scenes video too its a fantastic dose of Devin, and a beautiful way to send off the DTP. The artwork is absolutely stunning before I even start the live video I was mesmerized by the title menu. Most live music DVDs I have seen are let down by cheesy effects and bad editing; luckily the editing and feel of it perfectly matches up with the feel and beauty of this show. It almost… almost makes up for me being too broke to see the original show! The setting is absolutely stunning; the show took place in an Ancient Theatre in Plovdiv, Bulgaria. This sets the scene for this very unique show; the first set is ‘by request’ and DTP are accompanied by Plovdiv Opera – a choir and orchestra. It really is special hearing how some classics, newer tracks and even some that have never been played before translate with a choir and orchestra behind them. A personal highlight for me is ‘Deadhead’ such a powerful and emotional song, with all the added textures was truly a masterpiece. With some rather incredible pyro and fireworks the first set comes to an end. Devin is notably ‘slightly’ more sensible with less of his trademark humour between songs. It works though as there is something so majestic and deeply immersive about the show. The second set is ‘Ocean Machine’ in its entirety; celebrating 20 years since the album was released. Ocean Machine has always been a favourite of mine and it hits me after watching the show just how incredibly timeless it is. This set isn’t with the orchestra and choir, and has the addition of the original bassist on Ocean Machine John ‘Squid’ Harder. I definitely want to thank John as Devin let’s us know he was gonna drop my absolute favourite track ‘The Death of Music’ from the album but John told him he was an idiot if he dropped it. This track is definitely my favourite it’s a little different and out there, but that’s why we love Devin, and a track that shows his vast vocal ability off. There is also a behind the scenes documentary that gives you some interesting insight into things such as what sparked Devin’s interest in music and some rehearsal footage which also let’s you see how stunning the venue is in daylight too. There are some great funny moments of Devin in make-up before he goes on a Bulgarian TV show which is equally hilarious. Overall a great release, thoughtfully edited and put together and a must have for fans of Hevy Devy. Ocean Machine: Live at the Ancient Roman Theatre is out 06.07.2018 in various formats, DVD, CD and Blu-ray. Previous Ryan Roxie – Imagine Your Reality, new solo album out now!